Musical group CNCO and Mexican actress Aracely Arámbula came out as the biggest winners Thursday night as fans across the nation got to vote for their favorite actors, artists, TV personalities, fan clubs and influencers at Telemundo's 6th annual “Premios Tu Mundo” awards. 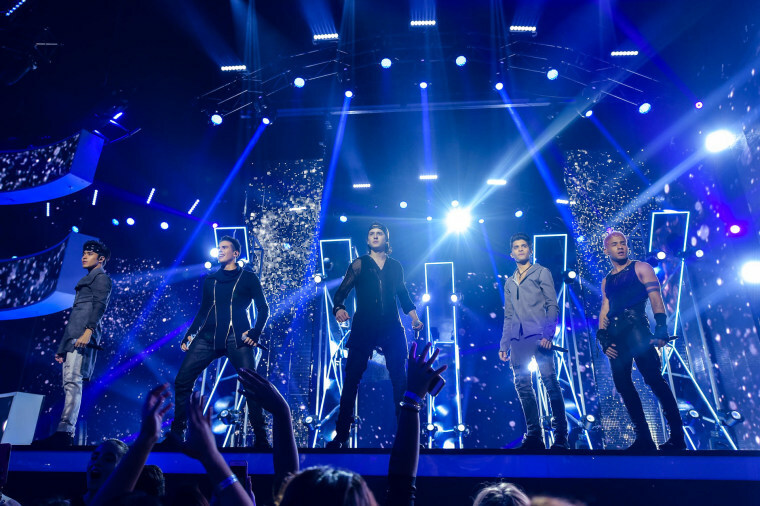 Heartthrobs CNCO received three awards including, “Artista Pop Favorito” (Favorite Pop Artist), and “Canción Comienza-Fiestas” (Party starter song). Also, their loyal fans won “Fan Club of the Year.” The group of young men, who came together from Univision's musical competition "La Banda," comprise a slew of nationalities: Ecuadorian, Cuban, Dominican and Puerto Rican. Arámbula won "Protagonista Favorita” (Favorite Protagonist) for her role in the telenovela, “La Doňa” and she also received the “La Pareja Perfecta” (The Perfect Couple) award alongside her co-star, Argentine actor David Chocarro. The hit series, “El Señor De Los Cielos,” won as favorite series. Hosted by Carmen Villalobos, Daniel Sarcos and Fernanda Castillo, Miami-based DJ’s Atellagali kicked off the event with a mashup of many favorite hits such as, “Mi Gente” by J Balvin, “Felices Los Cuatro” by Maluma and the very famous, “Despacito” by Luis Fonsi and Daddy Yankee. Electric performances also inundated the stage, all of them displaying the variety of performers from different Latin American countries and regions of the U.S. Tropical music legend Olga Tañón sang her single "La Gran Fiesta." She was also honored with the award “Legado Jenni Rivera” named after the late singer Jenni Rivera. The award was presented to Tañon by Rivera’s daughters and sister. NBC's World of Dance winners Laurent and Larry Nicolas Bourgeois, also known as Les Twins —they're from France — got people moving with their dance performance to "What Happened?" In an interview with NBC News, the duo said that after this win their work had just started and that they were producing music as one of their next steps. Apart from the musical performances, there was a moment of reflection surrounding national and international events. Telemundo and NBC News anchor José Díaz-Balart and the network's news team gathered on the stage to denounce hate and discrimination. This comes after the deadly events in Charlottesville and Barcelona. Another key moment of the night was when singers Nacho, Olga Tañón y Luis Enrique got a standing ovation for singing "Valiente" (Brave) to show their solidarity with Venezuela. The night finished with a performance by Cuban-American actor and singer Jencarlos Canela. He had the crowds moving to his new hit single, “Dure Dure,” which he premiered at the event.